Magic 360 - OpenCart 360° Product Viewer Extension. Top Rated Opencart 360 Spin Viewer. Style & sophistication. The ultimate 360 spin. Click to zoom in for a beautiful close-up. Multi-row spins can rotate up/down as well as left/right. What’s the best way to showcase a product online? In 360 degrees of course! 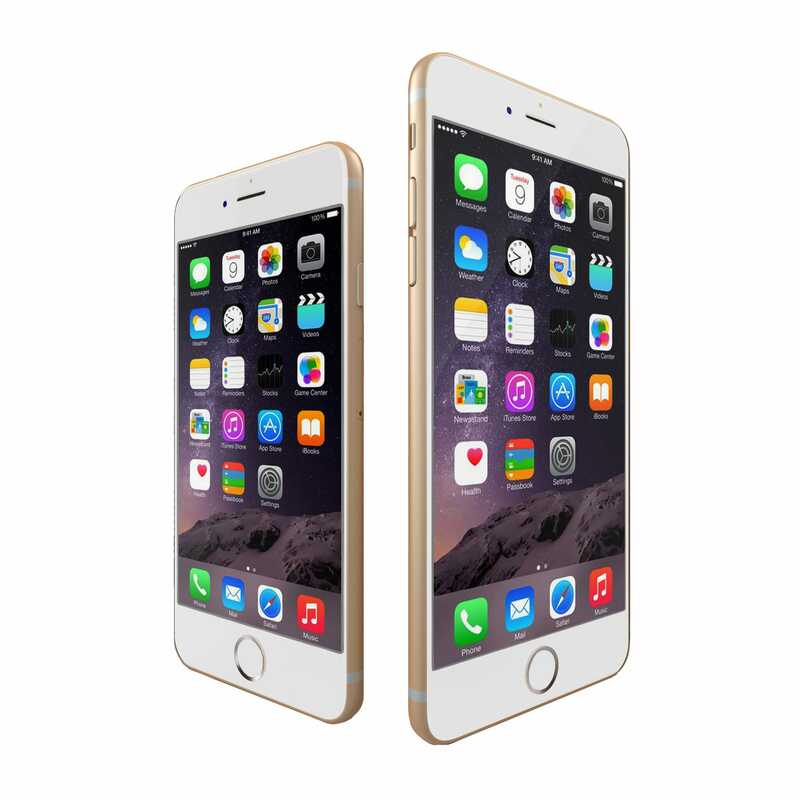 Magic 360 is a responsive OpenCart 360 degree viewer. It’s the closest experience to real life online. Magic 360 doesn’t require any development work, yet it looks excellent on desktops and all types of mobile devices. Our 360 view module allows you to create and embed 360 spins in minutes. Upload a set of images (images exported from 3D modelling software are also supported), tweak its looks and you’re ready to impress your potential customers with 3D goodness. 360 spins tend to increase conversion rates by at least 27% (source), they decrease returns and ease the load on your support. Well worth the investment! 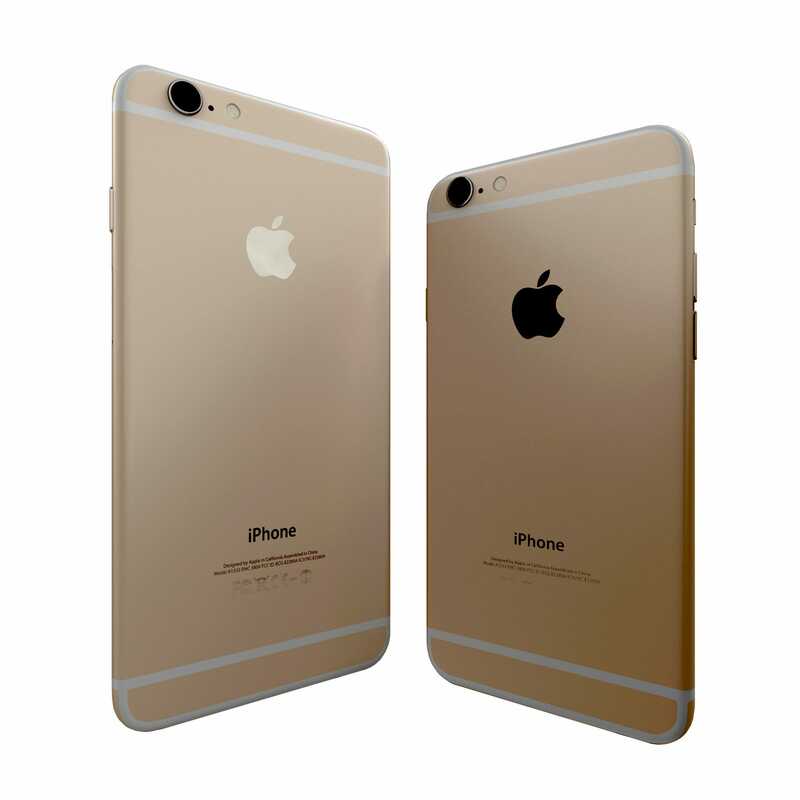 Show every detail from any angle – download Magic 360 today! Read reviews of Magic 360 on the official marketplace for OpenCart extensions. 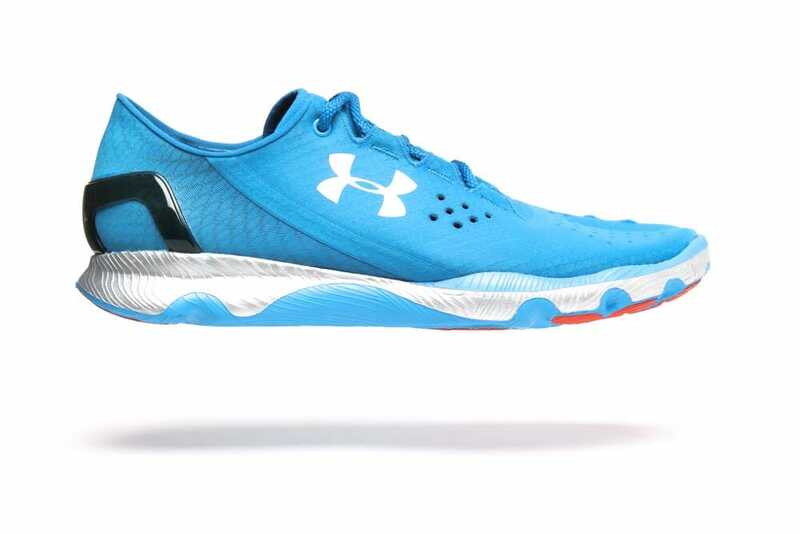 How do you convincingly demonstrate all your products benefits? Real life views for your customers - there is nothing more trustworthy. Magic 360 improves conversions on all OpenCart stores - from version 1.5 to 3.x. Magic 360 is perfectly optimised OpenCart 360 viewer. Our team of professionals spent 8 years constantly improving it. And we will never stop - our customers are our first priority. Contact our friendly support team if you need any help. To increase your Google visitors, Magic 360 uses SEO-friendly URLs. It helps search engines index your images, whether you're using a standard 360 spin or a 3D style spin that can be rotated up-down as well as left-right. The team is amazing. The product, support is simply flawless. Thumbs up! Excellent company and wonderful team. Product is amazing and the support is unbelievable! You guys offered me support even before your products were bought, amazing! Bright example of a goodwill company. Cannot fault this team. Not only is the actual product amazing but the support is perfect. Would certainly use them again...great customer service! Important: You will notice only 360 spin shows on product page (normal images will not show). This is because Magic 360 replaces OpenCart image gallery. Download Magic 360 for OpenCart (free and fully functional demo version). Unzip the file on your computer and FTP the magic360 folder to your OpenCart directory (on your server), keeping the file and folder structure intact. Go to http://www.yoursite.url/magic360/ in your browser > click 'Install' (replace yoursite.url with your domain name. 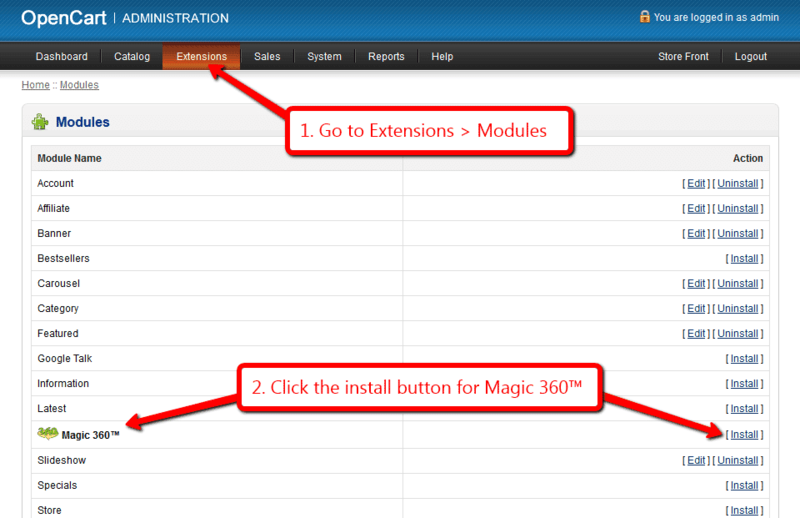 Remain on [Admin panel > Extensions > Modules] and click 'Edit' by the Magic 360 listing and enable module. 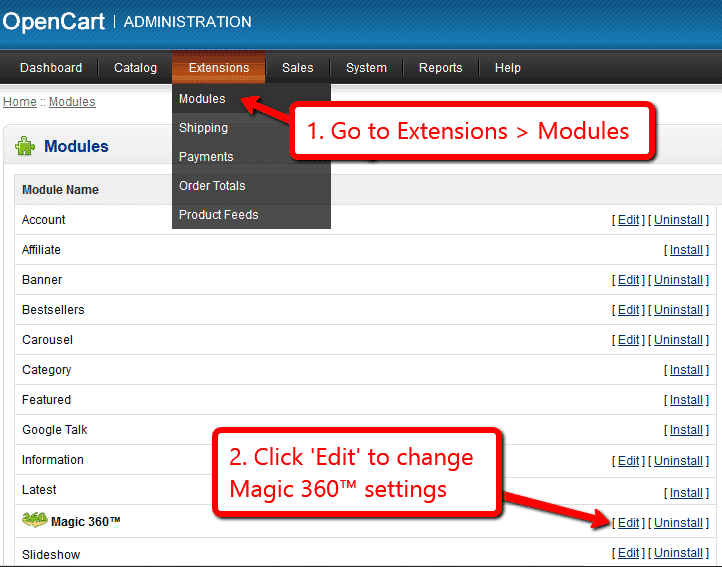 Customize the Magic 360 module through the [Extensions > Modules > Edit] menu in your OpenCart admin panel. If you run OpenCart inside Joomla using AceShop, please integrate Magic 360 using the instructions below. Go to [Admin panel > Components > AceShop > Dashboard > Extensions > Extension Installer] and install magic360.ocmod.xml file. Go back to [Admin panel > Components > AceShop > Dashboard > Extensions > Modules] and click 'Edit' by the Magic 360 listing and enable module. To setup a 360 spin, upload each photo of your 360 spin to the product page in your Joomla admin (recommended photos: 18 or 36). Go back to [Admin > Components > AceShop > Dashboard > Extensions > Modules] and click 'Edit' by the Magic 360™ listing. On the Magic 360™ settings page, enable the module and enter the product numbers for those products which should have Magic 360. Make any other customizations you wish to the settings. One important requirement is the number of images per spin (36 is the default). Magic 360™ demo version is ready to use! Customize the Magic 360 module through the [Admin panel > Components > AceShop > Dashboard > Extensions > Modules > Edit] menu in your Joomla admin panel. If you run OpenCart inside Joomla using MijoShop, please integrate Magic 360 using the instructions below. Go to [Admin panel > Components > MijoShop > Dashboard > Extensions > Extension Installer] and install magic360.ocmod.xml file. Go back to [Admin panel > Components > MijoShop > Dashboard > Extensions > Modules] and click 'Edit' by the Magic 360 listing and enable module. Go back to [Admin > Components > MijoShop > Dashboard > Extensions > Modules] and click 'Edit' by the Magic 360 listing. On the Magic 360™ settings page, enable the module and enter the product numbers for those products which should have Magic 360™. Customize the Magic 360 module through the [Admin panel > Components > MijoShop > Dashboard > Extensions > Modules > Edit] menu in your Joomla admin panel. If you run OpenCart inside Joomla using jCart, please integrate Magic 360 using the instructions below. Go back to [Admin panel > Components > jCart > Modules] and click 'Edit' by the Magic 360 listing and enable module. Go back to [Admin > Components > jCart > Modules] and click 'Edit' by the Magic 360 listing. Customize the Magic 360 module through the [Admin panel > Components > jCart > Modules > Edit] menu in your Joomla admin panel. Open the product which you'd like to spin and click 'Magic 360 images' tab at the top. Click Upload images > Browse your computer for your set of images. (Depending on your server settings you may have to upload images in batches eg: 01-20 and then 21-36). The 'Multi row spin' section at top of the page will automatically appear and update. The 'Number of images on X-axis' shows how many images are in your spin. 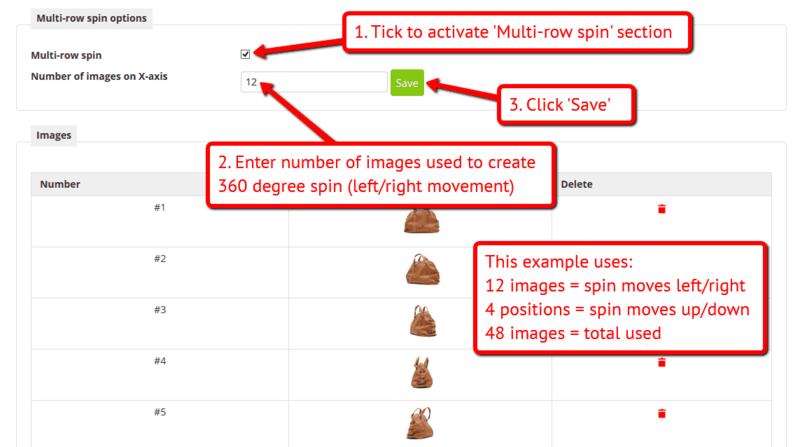 If your spin is 3D, click 'Multi-row spin' and enter the number of images which create the left/right movement. To spin some images and zoom others (like the example above) on your OpenCart 2.x store, you can install both Magic 360 and Magic Zoom Plus. Install the OpenCart extension for Magic Zoom Plus. Upload your zoom images via the 'Images' section. Upload your 360 spin images via the 'Magic 360 images' section (screenshot - ). Enjoy 360 spins on any CMS page on your OpenCart store. Get in touch with any questions you may have. Go to the module options page: [Admin panel > Extensions > Magic 360]. Insert an <img> tag for the first image in your spin. Wrap an <a> tag around it with a class of Magic360 and href of #. 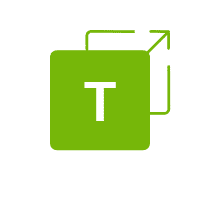 Specify the format of your file names using the filename parameter inside a data-magic360-options tag (this is described in detail on the Magic 360 integration page). Customize your 360 spins using the Magic 360 detailed HTML instructions. Thanks for trying Magic 360 on your OpenCart site! What did you hope Magic 360 could do? How can we improve it? Let us know, we're always improving our tools based on customer feedback. Delete the magic360 folder from your OpenCart directory (on your server). If you run OpenCart inside Joomla using AceShop, please uninstall Magic 360 using the instructions below. Go to [Admin panel > Components > AceShop > Dashboard > Extensions > Modules] and click 'Edit' by the Magic 360 listing and disable module. Magic 360 is now uninstalled! If you run OpenCart inside Joomla using MijoShop, please uninstall Magic 360 using the instructions below. Go to [Admin panel > Components > MijoShop > Dashboard > Extensions > Modules] and click 'Edit' by the Magic 360 listing and disable module.